The baseball world, but particularly Chicago, lost another giant figure today when Ron Santo succumbed to bladder cancer at the age of 70. 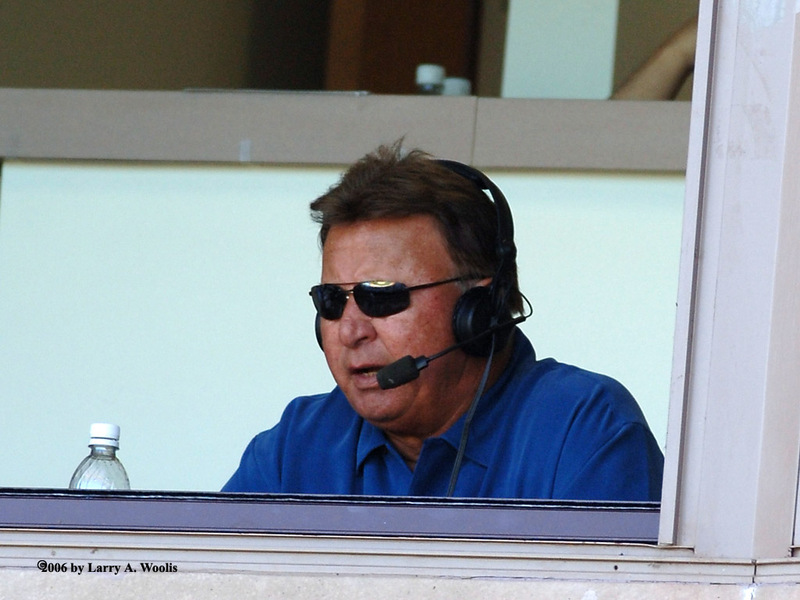 After spending his entire 15-year career in the windy city (14 seasons on the North side and one on the South side), Santo added to his legend in Chicago when he joined the Cubs’ radio broadcast team in 1990. During his 20 years as an announcer, Santo’s vocal on-air support of the team became a hallmark of Cubs baseball, which unfortunately elicited more groans than wild cheers from the team’s number one fan. Although Santo’s later tenure as a broadcaster overshadowed his playing career in the eyes of many younger fans, his prowess on the field was not forgotten by either those who saw him play or had the opportunity to seriously scrutinize his record. As a result, Santo is believed by many to be the best eligible player not currently inducted into the Hall of Fame. Unfortunately, if the All Star and gold glove third baseman is ever able to win enshrinement, it will have to be in a posthumous manner. After repeatedly falling short of election to Cooperstown, Santo learned to deal with the disappointment. One thing he never seemed able to fully accept, however, was the Cubs repeated failure to at least make, no less win the World Series. Sadly, Santo was unable to see either dream fulfilled. Santo’s career disappointments paled in comparison to his health-related struggles. In addition to the cancer that eventually claimed his life, Santo also suffered 15 surgeries, including two leg amputations, stemming from his life-long battle with diabetes. Before he was a Cub, Santo was a diabetic. At the age of 18, he was diagnosed with juvenile diabetes on the very day he signed his first contract. However, afraid that it might derail his career, Santo kept his affliction a secret. Even after learning the seriousness of the disease, he pushed it to the background and went about becoming an All Star baseball player. 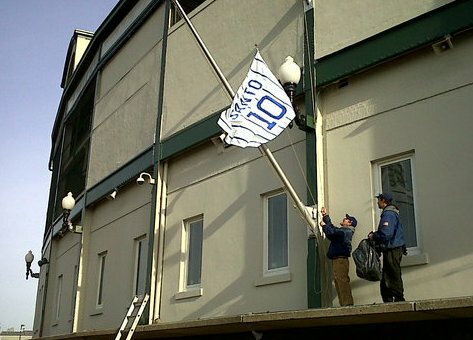 Santo’s retired number #10 is lowered to half staff outside Wrigley Field (Photo: @CubsInsider). Living in secrecy had become a burden, and Santo eventually decided to make the Cubs and his teammates aware of his condition after the All Star Break in 1963. However, he still wasn’t ready to let the outside world know about his diabetes, and swore those he told to the same silence he had lived with for years. The public didn’t learn about Santo’s condition until August 1971, around the time the Cubs held a day in his honor. Part of the reason to go public was so Santo could use the event to raise money for the Juvenile Diabetes Research Foundation, a cause he would champion throughout his life. According to Santo, however, the impetus for his revelation dated back three years earlier. 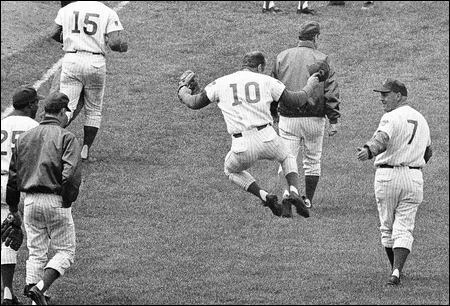 On September 25, 1968, Santo’s Cubs faced the Los Angeles Dodgers at Wrigley Field. Bill Singer has been pitching a 1-0 shutout against the Cubbies, but the home team had mounted a rally that brought Santo to the plate with no outs and the bases loaded in the bottom of the ninth. As he awaited his at bat, Santo started to tremble. Then, he broke out into a cold sweat. Finally, he had pains in his stomach, dryness in his throat and blurriness marred his vision. Santo wasn’t suffering from the strain of a pressure-packed situation. He was suffering from hyperglycemia. Although every shred of his common sense demanded that Santo remove himself from the game, he was afraid of what the reaction from his teammates and the crowd would be. So, instead, he walked to the plate and, after taking a strike, belted the second pitch for a game winning grand slam. The fans went wild and his teammates jumped in celebration. Santo, however, quickly circled the bases. There was no time to enjoy the accomplishment. He was in a race to stave off a diabetic coma. After revealing to the word that he was a diabetic, Santo became a tireless advocate for the cause as well as an inspiration to other player suffering from the disease. So, instead of mourning his death by lamenting the Hall of Fame’s failure to induct him or the Cubs hapless inability to win a championship, it seems much more appropriate to celebrate his life. And, what better way to do that than by making a donation to the JDRF in his name (perhaps a small prayer for the Cubbies wouldn’t hurt either)? Santo’s exuberance for baseball was evident even during his playing days.